Perfume Organization is not the exact sum total of today’s thoughts, but it touches on it after we meander through how I got there. I am not a hoarder, but I am comfortable enough with my clutter and assorted hobbies that take up space in my house (an empty surface needs a project to go on it!) I can often see over the edge into the abyss of hoarding. The only character trait keeping me from hurtling into that abyss – I don’t have much attachment to anything. My problem area is being acquisitive. Most of my adult life I thought I was comfortable with my clutter. What I’ve realized is I am comfortable with the space my clutter takes up in my house and my head, not truly comfortable with it. Let me tell you how this latest tidying obsession started. I decided it was finally time to get serious about the upstairs master bathroom remodel project, and that includes reclaiming a loft from a downstairs bedroom that adjoins the master and repurposing that space as a yoga/meditation/closet. Simple enough, right? First project was decluttering the area upstairs, and that means clothes first. I have this landing area at the top of my stairs where they put in a skylight and then tiled the area, and then the railing is on the other side, and the landing has a bookcase. Well, all my currently worn clothing seems to land in that Bermuda clothing triangle. I’m not sure why I have a closet – actually two of them upstairs, plus all the closets I’ve appropriated in the rest of the house – because that’s just a clothes storage area of crap I never wear. Started sorting, discarding, taking out bags of clothes I haven’t worn in years. Discarding starts lapping over into the kitchen and other living areas. Discarding things is addictive, but I usually stop well short of bringing permanent order out of some of the chaos because… Don’t know. After writing a short Facebook post about discarding so much crap and finding more, a comment mentioned Marie Kondo’s book, “The Life-Changing Magic of Tidying up: The Japanese Art of Decluttering and Organizing.” I think no, I’m not that serious, but buy the book anyway because … Don’t know. Changing/changed my life. In one sentence, her approach to tidying/discarding made sense. Do it in categories. Don’t do a room because often you just start moving things from one room to the next, then you have to sort it again. Somewhere along the line you get tired because the first room you sorted is now cluttered once again. Do it in big categories and don’t move to the next category until you’ve gone through the first. First category is clothes. That means ALL the clothes hidden in every dresser, closet, back of a chair, etc. If it doesn’t make it into the big pile on the floor to sort, when you do drag it up, it has to be discarded automatically. This makes you find every single last piece of clothing so you can make decisions instead of default having to discard. Once you see the pile, it’s staggering. I’m about 90% of the way through the clothing category, and I’ve thrown out probably 10-12 bags of crap, some of it two decades old -probably about 70% of the clothing I had. Not the scarves, though! I do have some sense left. I’m saving the scarf pile for last, and I love almost all of them and they all bring me unfettered happiness anyway. Once I finish discarding, then I will start organizing. Then I move on to the next big category – books. Then papers. Then the next thing on the list. Not giving the whole list, it’s in the book. The point? To eventually be surrounded only by things I love and bring me joy. If that means I have two exquisite dishes and bowls I eat out of daily and wash as soon as I’m done with them, that’s perfect. If I have 10 pieces of clothing that I wear with so much joy every time I put them on, that’s a full closet and a full life. Then we get to perfume. I have a lot of perfume because of my business, and that is just ongoing, but what I do have some control over is what I do with the empty bottles and the excess samples and things that accumulate. I’m decluttering those. Empty bottles are normally easy, they go in the trash. Except those old, rare Baccarat bottles that Candide Effluve came in, the old beautiful Golconda bottles, etc. I can’t throw those away, but I can’t store them indefinitely while accumulating more. I can’t be bothered with selling them because they really aren’t worth the time and effort it takes to deal with the details of selling. So what to do? Repurpose. I now have a house full of old Baccarat perfume bottles filled with diffuser oil and reeds. My house smells amazing through every square inch of its slowly being decluttered space. Recommend Thymes Frasier Fir diffuser oil and Seda France French Tulips and Japanese Quince and their Christmas diffuser oil. Bonus to all the above decluttering – I am finding that as I start removing excess, it frees up my head. That may not make sense, but that’s how it feels. Even though I’m focused on clothing now, I keep going through the kitchen and other areas with trash bags and tossing stuff, working on closets and drawers on a whim. Casual decluttering goes on at the same time as focused tidying. Second bonus: I am buying less. Now I think about, is this object something I will either use/need/is replenishment for a consumable, or will it be something I really love and brings me joy. If I get it, and it doesn’t bring me the joy I thought it might, I send it back for a refund. I don’t just keep it, hoping that I’ll learn to love it or use it or I might find it useful. This is good for the budget as well, which helps me pay for the master bath renovation! Third bonus: Refining your personal space so you have/keep only those things you love and bring you joy spills over into your life without effort. If you have been trying to find a way to sort out and simplify your life and fill it with joy – sort your personal space first and then wait for the magic to happen in all of your life. Cutting out toxic/annoying people is easier, as is reaching out to missed and loved friends because you see who brings you joy and who is just life clutter. All of this got me to thinking of what I did with perfume before, which was store, collect, hoard. If you are decluttering, what are you doing with your perfume? How do you choose what you really love and brings you joy? I have so many bottles that bring me so much joy and I’d keep no matter what. Today’s question: Have you ever tried perfume organization using the focus of joy and how much pleasure it brings you, or do you tend to keep more things that you don’t love and are only in deepish like with? Do you swap/sell those bottles that you just aren’t in love with? If you are a vintage collector, what do you do with the empty bottles? 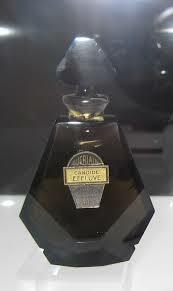 Am I a villainous cretin for filling that gorgeous Candide Effluve bottle with Thymes Frasier Fir diffuser oil? Second set of totally off the wall questions – would it be weird, when I do my kitchen renovation, to get rid of the refrigerator, which I hate because it screws up all my design ideas because of having to place it somewhere, and get refrigerator drawers instead? How do we feel about having different colors of cabinets in the kitchen? Like darker lower cabinets and lighter upper, as long as it all blends together? I am not a fan of matchy-matchy kitchens that look color monogamous. I neeeeeeds some diversity in my kitchen – it craves it like my lungs craaaves air (*Foghorn Leghorn*). Would that be too weird and ecclectic? Or should I say screw it and get what I want no matter how weird? Normally this is my first choice except when I’m spending thousands to do something permanent to a house. Last thing, would an island vanity in the master bath be weird? Don’t put it up against a wall, just island it and put a regular mirror and sink on one side and a vanity with seating and lights on the other side. Or should I just be normal and put it all up against a wall somewhere? What is the move? These are the trivia questions that are cluttering my shallow brain at the moment. ohh, love remodelling, but that’s probably because I was fortunate enough to live elsewhere whilst it was being done. Just loved picking out all the fittings & finishes. The fridge drawers sound really intriguing–it might be nice to not have to deal with a huge regular fridge. Wouldn’t mind different-hued upper/lower kitchen cabs, but would have to see a rendering of your bathroom center vanity idea. Unless your bathroom’s huge, it might take up too much real estate. Repurposing ‘fume bottles to hold diffuser oil is brilliant! I don’t have any empties. I have a bag of perfumes to rehome in my closet–too lazy to do ebay, don’t want to swap as I don’t need more–would love to find local perfumistas who’d like to purchase for modest sums. Did try to offload them at a local antique mall, but the owner only offered $175 for all 9, which struck me as a bit too modest. I love getting rid of stuff–don’t know how so many of us accumulate so many clothes! I’m probably going to be living in this, at least during the master bath reclaimed loft portion since it is upstairs and I have two other bathrooms. Fridge drawers now, i believe are easily replaceable if you have to, they just slid out and new ones go in. I just hate the whole where do you put a monstrous fridge thing, and I don’t need to store that much food now that it’s just me, and I want one drawer for beverages or I’ll get a drink fridge for that. I need my Bai-5s chilly and my champagne. But I’ll make sure that’s true, that I can pull them out, fix or replace and not have to tear apart my kitchen. I saw the bathroom center vanity idea somewhere, and it just intrigued me. I live by myself, so I really don’t want two sinks in the master, and I figured this solved that problem, but I could solve it as easily by putting it against the wall and making an area with one sink and beside it the vanity with a seat. I love my diffusers so much and almost broke my arm when I thought of it because they just sit there doing nothing. i’m also giving them away to family and friends with reeds and oil in them. They are happy too! And whenever I priced out diffusers with bottle, they were adding in a crap bottle for a ridiculous price, and these are soooo much better than that. throwing out clothes on this level is cleansing beyond belief. I’ve always gone through things periodically, but never really dug into it deep, just sacked up a bag or two and tossed or gave it away. This is a major purge. LIVE in your house! I am a hermit and an introvert, but for decades I arranged my house for company/entertaining. Of course, those things almost never happened and I mostly lived in my bedroom because it was the only room set up and designed for my comfort and happiness. One day I said ‘eff it!” and spent the next 6 months making my entire house a place that suited ME. Sounds corny, but my heart opened and I was filled with joy. I even began to host a dinner once in awhile and the few guests were so comfortable in my reclaimed space they did not want to leave. Life is short, Patty. Your house should comfort, shelter, embrace and delight you, not other people. Listen to your heart. Have the island, make your kitchen ombred with colored cabinets, live in a place of delight. You deserve it. Read House As a Mirror of Self: Exploring the Deeper Meaning of Home by Clare Cooper Marcus. I agree, and I love this reply! Thank you for mentioning the book, too. I will check into it. Okay, that was inspiring. i just called Habitat for Humanity to come pick up my ginormous solid wood dining room table and charis built for 8 that I don’t use because I’m going to repurpose my dining room for… I don’t know! But the possibilities have me giggling at what it might become. It just won’t be a formal dining room. Maybe meditation room or yoga room or both or crafts with a small tall bar table – that I now have in my master bedroom for lack of a place to put it – to eat at. I can put my Harmonium in there and my yoga mat and… I don’t know yet, but just opening up all possibilities is exciting, thank you!!! What you say is what I’ve been thinking. I want this to be MY dream home filled and planned around my life and what makes me happy and brings me joy. I don’t want it to be a storage shed for other peoples things and someone I used to be and the projections of a life I thought I was supposed to have. Shedding all the things I don’t love is the first step to having a blank canvas to repaint my home on. I have helped a hoarder clean out, and keeping useful things and hoarding are very different. De-cluttering is great and it’s healthy to clean out and get rid of old junk. On the other hand, I can think of lots of times I tossed or donated something that I really wish I hadn’t. It’s easy to get carried away. I’m lucky because with clothes I’m not sure of, they go to the purgatory that is my closet at Mom’s, and if I don’t wear them there or drag them back within a year or so they’re toast. The problem with getting rid of older clothes is that the fabrics aren’t available at reasonable prices anymore. Have you tried to find a nice cotton tee shirt lately?! I actually darned a hole in my only remaining black, v-neck jCrew tissue tee the other day because I can’t find a substitute. I don’t have a huge FB collection, mostly small decants and samples, and I feel like I should hang on to most of these for reference. Besides, how many times have my tastes changed? If I gave away all of, say my iris samples, wouldn’t I just have to buy them all over again when I decide iris is my favorite note? By the way, I think your diffuser solution is wonderful. Refrigerator drawers sound great. My parents considered them years ago when they built their house and decided that it would be a huge problem if repair/replacement meant entirely new cabinets. Have you considered paneling your fridge to match the cabinetry? I see no problem with non-matching upper and lower cabinets. Think it looks great. The bathroom idea…I’m not sure I understand why. Is your bathroom so huge you need to fill the space? What will you do with the walls? Is there enough room to comfortably maneuver around an island? Will you knock things off/splash water everywhere? Not voting against the idea, just curious. Our current master bath is unnecessarily huge, I could do yoga in the open space. I would love to have floor to ceiling mirrors on a wall instead of the crummy vanity but I don’t thing the room would flow properly with a free-standing sink area and I would be forever knocking the soap over the back edge while groping for a towel. I am hanging on to a raggedy black cotton sweater by Jones NY Jeans that I’ve owned for at least 15 years, darning the hole under one arm, because I can’t find a decent substitute. You are absolutely right about the fabrics, especially in 100% cotton. yeah, worrying about throwing away something I might need later – screws, brackets, etc – is what paralyzes me from doing a real declutter. I’ve just decided I’d rather rebuy something than put off doing something that will make my house work better for me. It’s one of those “i don’t want to do a halfway measure this time” so I can make it stay that way forever. In the book, she says she has no recidivist clients – that once you start using this method and put everything back in its place when you are done, you won’t backslide more than a skosh and then you will autocorrect. Sounds logical! Then i want those barn door sliders as the door for it because the entry into the bathroom is right at the top of the stairs and has an open hall way to the bedroom itself, so I don’t want doors taking up any space. I might do a pocket door instead since they will be redoing that wall anyway to get me a larger entry than the 18 inch doorway I currently have going into the bathroom. Who did that int he 1970s when they popped the top on this tudor? I mean, srsly. I hate matchy-matchy and love having different upper and lower cabs. So much more interesting, I think. My only thought would be to keep the lower ones darker than the uppers. If you think you could get the necessary refrigeration space you need with drawers, I think that’s an excellent idea! The Euros seem to get along just fine without huge fridges. I’d be lost without my two, but I bet you’d be fine with drawers. And I am in love with the idea of a bathroom island! I have a little over two hundred of bottles of perfume, and several dozen scarves, plus a small bounty of costume jewelry, but as long as I don’t buy any more, I am comfortable with the amount I have. (Well, let’s get real, I will always find room for some more juice, but thankfully, I haven’t even been temped to try too many new releases the last few years, thank God.) I could get rid of a few scarves, and I do weed through them and the jewelry on occasion, so I don’t feel weighed down by them. All my bottles and baubles bring me great joy, and I don’t feel weighed down by them. Craft supplies and seasonal decor, on the other hand… ugh. I need to do another purge of Autumn decorations, in particular. Problem is, I l have purged twice and am down to things I still really love. But storage is an issue! And I have this weird thing about not wanting to give it away unless I know whoever gets it will really, really love it. yeah, I don’t want to do something crazy with color, and that’s what I was thinking – doing a wood lower that is darker, then white/cream uppers and a countertop that ties them both together. I have old hardwood floors, so getting the shading for the lower wooden cabinets will be tricky so nothing looks stupid. But i definitely want lighter color upper cabinets/shelves. yeah, you can get drawers with more space than a fridge, and you an have one fridge and one freezer drawer or all fridge drawers and use my chest deep freeze in the basement for freezing or something else. then you can sort what you put in each drawer – fresh produce/cheese in one, condiments, leftovers, meats in another. Then drinks in one and then one freezer drawer. Fridges accumulate junk too, and I cook for one person, i don’t need tons of space, just adequate space! Hobbies is a whole other area that will be tricky. I have a LOT of yarn, and I’ve organized it pretty well and have good storage for it, but I’m thinking I need to shed some of it in this process as well. I should also sell my kiln that was fun while I was into it, but I’m really not going to use it long term, I don’t think. I’m pretty excited about getting through the books. There aren’t that many that I really want to keep, but I have a hard time getting rid of them until now because they are so freaking heavy to throw out! I’ll try to find somewhere to donate them, but if I can’t, then in the trash they go. I think what you say is key – if they don’t weigh you down, then there’s nothing to worry about. My stuff is weighting me down, and large swaths of it have to go. Oh, I tend to hoard stuff too. I used to live in houses until some eight years ago and I had much more space but recently it’s getting serious. I must rearrange things and throw them away regularly otherwise I’d be stuck in my bed for the rest of my life. Ok, let’s start with perfume: every now and then I have to admit that I can’t actually wear and love everything I’ve hoarded so far, so I invite my girlfriends for a perfume swap. Every woman has at least one perfume she bought impulsively or got as a present, but did not like it. Then we put everything on the table and test them and take whichever we like – and afterwards we eat and drink and go home happy! The empty bottles of vintage perfume are a bigger problem. I keep mine since my high school days. My daughter played with them as a child and I guess my grandchildren will too. Because I’m not throwing them away. No way! BUT I keep them at my mother’s house in my old room so they don’t bother me at all. As for the kitchen – I see why a separate refrigerator would be a problem. The size and color has to match everything else but that’s not so easy. Why don’t you buy a built in refrigerator? I haven’t seen the type with drawers that you mention (except for the deep freeze), but I don’t like it because you don’t actually see what’s inside until you open it. So usually you have to search through the drawers unless you are very organized. And I think a kitchen in two or more colors can be lovely. Do it if you want! I hate repair works in my home but the satisfying feeling afterwards is really worth it. Great way to get rid of not loved as much as you should perfume. I don’t have any friends locally who wear perfume. Empty vintage perfume bottles are soooo pretty! Back when they had stoppers, which makes them great containers for things, once you figure out what can go in them. With the separate drawers, you know what’s in what generally – fruits and veggies and short-time consumables all go in one drawer. Condiments, leftovers, meats go in another. Beverages go in another. Then one freezer. You wind up with the same space, just sorted differently and not in a big monstrosity that dominates the kitchen. it tucks away nicely. Our love affair in this country with gigantic refrigerators is epic and silly. 🙂 I mean, I grew up in a family of 7, and we had on tiny fridge for all of us, eating three monstrous farm-type meals per day. One chest deep freeze. Then we had an extra tiny fridge in the wash house for summer produce like watermelons, cantaloupes, tomatoes, the things that took up too much space but needed to be cooled somewhat. I’m not looking forward to the ugh factor of the reno, but I definitely will love everything when it’s done. I think 2016 is my renovation year. Most of that book is really cool. I enjoyed it but didn’t do the full declutter. Different colour cupboards in a 2005 onwards thing, you might be sad in 10 years time. K.I.S.S. for the kitchen. It only needs to be functional and easy clean. The back to back basin & vanity sounds like an excellent idea. Functional and clever. Obviously you will do whatever you want. I hope those choices bring you oodles of joy with every use. Yeah, i’m not doing anything crazy in the kitchen color-wise, and my kitchen isn’t big enough to do anything but simple. I just don’t want to feel constrained by rules that it must be all white/cream, which is the color I have to have in a small kitchen and is okay for the upper part of the kitchen and the countertop, but I think I prefer darker wood on the bottom because. don’t know. Yep, feelin’ the clutter here too. I have way too much stuff, and have collected a ton of vintage perfumes, scarves, handkerchiefs and costume jewelry (hi, tammy!) because I love them, but also because I believed that, as collections, they wouldn’t take up too much space–hah! Yes, re-purpose the vintage perfume bottles, why not? Much better to enjoy than to curate. The kitchen ideas sound good–go for it! Not sure about the vanity, but only because I can’t see it in my mind’s eye. Houzz.com is a very good resource for people thinking about renovating, redecorating and landscaping. Thanks, all, for the book(s) recommendations! Scarves aren’t the worst thing to hoard, but they can at times get voluminous. Mine are doing that now. 🙂 But only by a little. That was me! I was so irritated in the kitchen redesign in my head, trying to put some big fridge in it, and it kept screwing up my flow. I said something to my youngest son, and he said, have you tried to find some alternative refrigeration option, like drawers? Duh. they use those in restaurants, and a few manufacturers are now making them for domestic use. You can leave them stainless steel or put a cabinet front on them so they look like part of the cabinets. Standard cabinet side, too, so you can shove something else in there if you want. I love the refrigerator drawers idea. And although I like the idea of darker lower cabinets and lighter upper ones, I worry that it, along with the vanity island, will look dated and/or make it hard to sell the house — though that may not be a concern for you, if you just want to make it into a space that you love. Using a dining room for another purpose is no biggie, because you can always stage it as a dining room when selling. This is all on my mind because we’re selling our house, and let me tell you, moving is one of the best decluttering motivators! We’re not moving until May, so I’ve been going around the house, thinking “I do NOT want to move that!” and donating/giving it away. But I also need to declutter some of my clothes. I’m a poet, so getting rid of books is painful. As far as perfume, I haven’t been collecting long, so it’s mostly samples that I’ve accumulated. But I pass them along to my grad students, who luuuuuuurv them and have so much fun testing and swapping them. Good luck with making your space yours! I’m probably not selling this house until I croak. I love the house, love my neighborhood and can’t see wanting to swap it out. But I do keep resell in mind, just in case. I have to super love something to risk it. the refrigerator drawers I think is the move. I predict people, once they know about them, will move it up on their wishlist of things they want. I did find a book recycling program, They actually come through on mondays and Fridays and pick up books and then go find homes for them. I just put in the request for them to stop by on one of those Mondays or Fridays, leave the books in boxes on the porch, and they go to new homes at senior centers, homeless shelters, hospitals, other places where fresh books are always wanted. I did a huge paring-down of possessions over the past three years, and I mean huge. I moved from a 3 bedroom, 2 car garage house to a 2-bedroom, 1 car garage home. After donating/selling/giving away what was extraneous, I found I needed to re-buy one item–a handheld vacuum. I had sold mine at a garage sale but I found I really did use it for the car and little cleanups. I say, lighten the load all you can. Don’t want a traditional fridge? Get what you want. I tore out the bathtub and put in a big, roomy shower with a seat and grab bars (for the future) and I don’t miss the tub at all. I’m painting my 50’s metal kitchen cabinets with automotive paint (the kind with sparkles) because that’s what I want. As far as perfume, I am “trading up.” As I find scents I like better, I’m getting rid of what I used to like and replacing them. For instance, I replaced Guerlain Terracotta with Kerosene Unforsaken, because I like the Unforsaken more but it fills the same place in my perfume wardrobe as the Guerlain, so one has to go. It seems to be working pretty well. Also, I made a rule that everything has to fit in the perfume cupboard I have, so my collection is limited in that way, also. That sounds wonderful, that you got exactly what you want. I think people too often think about resell, and if you aren’t reselling in the next five years, screw it, do whatever you want and let the next owners worry about remodeling. What color are you doing the cabinets? Must know and need pics when you are done, that sounds amazing. I’m not sure I’m ready for metal kitchen cabinets, but i sure would embrace them if they were already in my kitchen! I like your perfume plan, it is sensible but allows you to have plenty of things that you love! The upper cabinets will be a creamy white (no sparkles) but the lowers are copper-colored, like a new penny. The backsplash will be white with copper accent tiles. Pics for sure when it’s done! We are considering redoing our kitchen and master bath while living here and it is a daunting thought. But I think we are going to go for it. I know what you mean about wanting a personalized kitchen. We live in a northern suburb of NYC and EVERYONE’s kitchen is French Country or Shaker, which is so not my style. I prefer modern cabinets with clean, stark lines. We are considering doing light zebra wood cabinets on top and dark zebra wood on the bottom with a large island. I’m pretty sure this type of modern kitchen will make my house unsaleable in French Country-land but we don’t care we. I say get the kitchen you want and smile every time use it because it reflects who you are and what makes you a unique interesting person. My parents are in the same area and used an architect based in Bedford who’s got a very modern, clean-lines sensibility. Their new place is gorgeous — email me at t a r t u f i at g m a i l if you’d like the architect’s contact info. I think you do the modern you want for sure, it sounds amazing, seriously. If done well, no matter the style, when you resell, someone will love it no matter what. I’m not sure what I want in terms of style,I think I’m probably transition, not that traditional, but I don’t get full into modern, but something in between with touches of both in the right places. I don’t like fancy scrolls and that, but I don’t want the lines to be too spare or severe. something in the middle of that. Good Luck! Please post pictures, I’d love to see how it turns out. But I have to say just the mere though of having all that dust and demo in our house makes me exhausted!. Refrigerator drawers are a brilliant idea. And I completely agree with everything Chris said above—your house should be exactly what you want it to be. I hope you report back when you’ve gone through the whole Marie Kondo process. I can sort of picture making it through all the clothing, but it’s the other, more nebulous categories that scare me. I love that you guys see the brilliance of refrigerator drawers. It makes me so happy to shop for them and plan a house sans refrigerated monstrosity. Every time I go through one of those ktichen magazines and see a gigantic fridge destroying the lines/flow of their kitchen, it makes me shudder. I don’t know that I would have taken the leap but for having already started on my own. Her book helped me shape what this decluttering looked like done right. My parents moved from their farm in 1979, and we had to clean that all out. Talk about packratting. It was my dad that kept everything. he prompty built two sheds on their new property just so he could start storing extraneous crap. My mom sold that house and built another one on the same property, and she now has no sheds and has only the things she wants in her house, no clutter at all. I will report in when I get mostly done or all done or both, just to talk about the process. It’s incredibly freeing somehow, it’s like a sculpture, I’m carving away all the things that don’t look like my home and me, and we’ll see what’s left when I’m done. The bathroom and kitchen remodel is a total nightmare still. We fired the guys who started the project but they couldn’t have been bothered after almost a month to have anything completed. And it just sat for a couple months and we just hired another guy who was flabbergasted on what went down and said that this is pretty common for unlicensed and uninsured contractors. He told us that the upstairs bathroom that is half done will be done first, then move on to the master bath, then work on the kitchen. He will be starting Monday but he did warn us that he and his crew start at 7am and probably will be working until 4 or 5 in the afternoon. I’ll be so happy when this is all done. I’ve started to clear stuff out of my house. I just went through a lot of my clothes and got rid of them. I haven’t gotten around to even attempting to sell the perfume I don’t want on E-Bay but I will get there, eventually. I’m so glad you have a great person to come in and work on this. Getting someone out there that will follow through seems like it shouldn’t be hard, it’s money on the table for them to come pick up when they do the work. What do you suppose keeps them from following through? Too busy? Don’t care? I hope you get an amazing job from your new guy! I had a clear out recently and it is an ongoing process for me. I prefer having less stuff and rather have quality things over quantity. I look at websites like The Minimalists to keep my motivation for this up (and once in a while George Carlin’s skit about “stuff”). The benefits for my budget are a big plus. I feel better when I donate clothing and things to Goodwill or other organizations than I do just throwing it out. Old tee shirts that aren’t suitable for donating make the best rags for cleaning. The super soft ones are great for cleaning and polishing jewelry. Agree. I’ve thrown a lot of things away so far that I should have donated, but it seemed more important for my forward trajectory to keep moving. Now I’m being more thoughtful about books, etc., and getting Habitat, Salvation Army and other places to come and pick things up so they can repurpose them or sell them to fund their mission. I could de-clutter some. I could lose some weight, too. I do throw stuff out or send it to Goodwill etc on a regular basis. But too tidy minimalistic styling makes me nervous, Frankly. I like some clutter. It gives me joy. I exercise regularly but I like my extra 15 pounds. They give me joy, too. I am just starting with this hobby (cough …obsession) but I found that amazon had a really great and cheap makeup organizer with pull out drawers and lipstick slots just perfect for samples. Don’t have too many FBs to deal with (yet). Unfortunately my cats have excellent tastes in their preference for vintage perfume sample toys to play with so my samples are currently stored in this makeup organizer behind a closed bathroom door. HI Patty. My husband is a contractor so I am continually in the throws of a renovation project. My house was originally a barn that was renovated into a cottage. Needless to say, it has charm and challenges. I was considering dishwasher drawers for my kitchen, but decided against them based on the advice of a salesman at a local appliance store. If you haven’t already, I suggest you check into it. I would imagine that drawers housed in a cabinet could be hard to work on. It’s a neat idea though. Kitchen: I like the two tones cabinets for ”french country” style go on pinterest you will see so usually it is cream and a greenish-bleu at the bottom … love! rustic too …. this one is more metallic with wood again Love! but if you go modern – traditional one tone is maybe better, also if you plan to sell in 5 years, one tone is more safe. ”hidden fridge” is what I would love in my kitchen but oh so expensive. Bathroom: an island WHAT?! what kind of square footage you have? you have a mansion??? hell yes go with an island and in your walking closet too! you can never go wrong with an island, go with a marble counter top on your island. Clothing: ok next time you do a cleanup of your closet, you do an exchange clothing party. Call up a bunch of girls (no guy allowed) they all bring clothing they are not wearing anymore and you exchange. My friends and I are doing this 4-6 time a year we bring wine, the hostess do a little lunch and we spend a nice time exchanging clothes and catching up on our life! Before I hit on Marie Kondo’s book I kept on decluttering and ‘simplifying’ and space clearing and it was just such an everlasting strain. I should have listened to my kids – they operated on gut feelings. What little they loved was not to be discarded ever and the rest they just didn’t care about. Their spaces were always vibrant and essentialist. As for the perfumes: I have 1200 full bottles, plus decants in boxes and so on. They live together in the cellar on ikea shelves, sorted by alphabet, so I can find anything at all. 400 at least need to go, I’ve outgrown them. They are millstones. But it is really a lot of work to dispatch of single bottles. I do not know what to do, I simply want to use my time creatively. Kitchen: gut, again. …what you really need is plenty of free surface. Throw out the machines, the doubles, the gadgets, the fridge. Buy fridge drawers. I have them, they work fine. If you can, make space for a cool larder/ pantry. Also have a dishwasher with two separate autonomous tiers. Fantastic.